In this article, we aim to analyze the residential options of the rural population of the Netherlands in the late nineteenth and early twentieth century from the perspective of push factors operating at different levels: the household, the municipality and the region. We contrast the decision to stay with moving in several ways: within the municipality or its immediate surroundings, within the region, to a different region, to a city or abroad. The backgrounds of these differences in migration paths are found in 1) individual characteristics like age and previous migrations, in 2) household background like the socio-economic status of the head, the composition of the membership, its religious affiliation, and in 3) local and regional contextual variables, such as population density, type of agriculture, inheritance practices and non-agricultural employment. We make use of the Historical Sample of the Netherlands, a large database with detailed information on more than 34000 families living in the Dutch countryside between 1850 and 1940 and propose a competing risks survival analysis model to understand the balance between individual and contextual factors in migration decisions of the rural population. Dans cet article, nous cherchons à analyser les options résidentielles de la population rurale des Pays-Bas de la fin du XIXème au début du XXème siècle en considérant des facteurs d’incitation opérant à différents niveaux : le ménage, la municipalité et la région. Nous comparons la décision de rester avec celle de migrer de plusieurs façons : au sein de la municipalité ou de ses environs immédiats, dans la région, dans une autre région, dans une ville ou à l’étranger. Le choix de ces « chemins migratoires » s’explique par 1) des caractéristiques individuelles telles que l’âge et les migrations précédentes, 2) des caractéristiques du ménage, telles que le statut socio-économique du chef de ménage, sa composition, son appartenance religieuse, 3) des variables contextuelles locales et régionales, telles que la densité de la population, le type d’agriculture, les coutumes d’héritage et l’emploi non-agricole. Nous faisons usage de l’Échantillon Historique des Pays-Bas, une grande base de données contenant des informations détaillées sur plus de 34000 familles vivant dans la campagne néerlandaise entre 1850 et 1940. Nous proposons un modèle d’analyse de risque de survie pour comprendre le poids des facteurs individuels et contextuels dans les décisions de migrer de la population rurale. 1Until a few decades ago, the outmigration of rural populations was studied mainly by analyzing the economic and demographic forces that hampered rural populations to have a sustainable livelihood in the countryside [for an excellent overview of the recent historiography, see Oris, 2003]. The history of the rural exodus was the history of overpopulation, proto-industrial decline, rationalization and mechanization of agriculture on the one hand, and the lure of urban employment or agricultural opportunities abroad on the other. Thus, migration was seen as an adjustment of economic and demographic imbalances between regions. But this was a rather one-sided view on rural migration. The intense local and regional mobility of the population was often overlooked, as it did not result in net regional losses or gains. Recently, much more attention has recently been paid to the role of communities and families in forging links between sending and receiving regions and in sustaining migration networks [e.g. Fontaine, 2007; Guilmoto, Sandron 2001; Wegge, 1998; Lesger et al., 2002]. Also, the role of migration experiences of family members creating ‘family territories’ has become part of the agenda of historical migration studies [e.g. Rosental, 1999; Bras, Neven, 2007; Kesztenbaum, 2008]. Finally, family situation (e.g. death of parents and arrival of stepparents) and individual characteristics, such as position in the sibling order and own migration experience, have been added to increasingly complex explanatory models [Kok, 1997; Dribe, Lundh, 2005; Bras, 2003]. 2Already in 1990, Massey  advocated the use of multilevel models to capture the (cumulative) interaction between individual propensity to migrate, household strategies, evolving networks of migrants, and community factors, such as the structure of landholding. Indeed, such an approach has been followed in several studies, but, often, such models are based on data collections that are full of individual information, but relatively limited in their geographic scope. Therefore, they generally do not allow for comparisons across soil types, agricultural systems or regions with different inheritance practices. Indeed, in the nineteenth century, the Netherlands displayed a remarkable diversity in terms of regional cultures (e.g. dialects) and rural economies [Knippenberg, De Pater, 1988]. Also, many studies focus on one type of migration only, e.g. emigration; leaving home or rural-urban moves. Rarely are these different types of migration interpreted as an array of residential options, and the relative importance of familial or contextual factors for individuals in deciding between these options is hardly ever studied. In this article, we explore a relatively new source on rural migration in the Netherlands. The Historical Sample of the Netherlands [Mandemakers, 2000] covers the entire country and allows us to connect migratory moves of individuals with the family situation on the one hand, the community on the other. We will combine a multilevel approach as envisaged by Massey with a competing risk analysis, capturing the full variety of migration options. Thus, we will contrast ‘staying’ of rural inhabitants to local and regional migration, interregional migration, migration to a city, and emigration. In doing so, we hope to understand the relative importance of individual, household, and local factors in choosing one type of migration over another. 3In the next section we give a brief overview of the historiography on internal migration in the countryside of the Netherlands, and we focus on hypothesized ‘push factors’ for migrating that have been identified in the literature. Then, we will introduce our dataset, and describe the design of our multivariate model. We will focus on the migration of families. The central question will be what household and what (local or regional) contextual factors determine whether people will leave, whether their outmigration will be short or long-distanced, and whether it can be seen as a true rural exodus in the sense of moving to a city or abroad. 4Before discussing specific hypotheses, we provide a very brief sketch of the changes in rural migration patterns in Dutch history until the Second World War. The Dutch economic success of the seventeenth century was based, by and large, on seafaring, trade and commercial agriculture, and was concentrated in the prosperous and populous coastal regions. From the second half of the eighteenth century onwards, the Dutch lost their competitive edge and, although still wealthy, had to face economic hard times. The once booming coastal areas of Holland stagnated, with several cities undergoing population decline. For centuries, the coast had attracted seasonal workers and sailors for the East India Company from the eastern part of the country, as well as from Germany and beyond [Lucassen, 1987]. However, in the nineteenth century this pattern did no longer exist. Until about 1875, the western, urbanized part of the Netherlands had a very small migration surplus. Only The Hague, the capital of the newly unified state, and Rotterdam, the gateway to expanding Germany attracted large numbers of newcomers. Not surprisingly, people escaping the severe economic crises of the mid-nineteenth century did not go to the cities, but went abroad, in particular to the United States. They joined a stream of dissenting Orthodox Protestants, who hoped to find in America the religious freedom they missed in the Netherlands. For a long time, America remained the most popular destination of emigrants, to be superseded by Germany in the final decades of the nineteenth century [Oomen, 1983]. From the last quarter of the nineteenth century onward, employment in agriculture diminished, due to the agricultural crisis (1878-1895), and mechanization. Many people from the afflicted regions left for the, by now expanding, cities in the West, but also to the new industrial centers in the East and South and the coal mining area in Limburg [Ekamper et al., 2003; Engelen, 2009]. When commuting possibilities increased (e.g. through the advent of the bicycle in the early twentieth century), rural people living close to towns with industrial employment no longer needed to migrate for work. 5The literature on rural migration in the Netherlands is characterized by either very general studies based on census data [e.g. Ter Heide, 1965; Kok, 2003; Engelen, 2009] or by local or regional studies in which migration flows are broken down by direction, age, social class et cetera. Many interesting hypotheses have been put forward in these local studies, but they have hardly been tested for other regions. We lack the space to discuss these studies here in detail. The remainder of this section will be used to summarize the major findings on factors explaining rural migrations. We will focus on factors that influence migration propensities of the ‘general’ population, and factors that relate specifically to households, as these will form the core of our empirical survey. We limit our analysis to migration of heads of household in the age of 25 to 40 years old. We are fully aware that this limitation covers only a part of ‘all’ migrations. Unmarried adolescents generally form the bulk of any migration stream, but the discussion of their migration behaviour (which involves patterns of leaving home, marriage, education and service) will have to await another occasion. 6Migration is ordinary defined as leaving the community (municipality), generally ignoring local, residential mobility. However, as it is our aim to study all types of migration as an array of options, we propose a continuum of migration types ranging from local migration (all residential moves within the municipality and to neighbouring rural municipalities within 10 kilometres), regional migration (all moves to rural municipalities within a 10-40 kilometre radius); interregional migration (same but more than 40 kilometres away), urban migration within the region (less than 40 kilometres distance), urban migration outside the region, and emigration or moving abroad. 7Factors causing regional differences in migration intensity and direction of migration flows of the rural population are type of agricultural system, inheritance rules, non-agrarian employment opportunities in the region, population density, and religion. Besides this we have to consider changes in the general context which we can define as period effects. These are for example periods in which economic cycles differ for rural and urban areas, as this might trigger migration flows. This is particularly true for the agricultural depression of 1878-1895, but the effects differ by agricultural system. Remarkably, the Great Depression beginning in 1929 limited migration from the countryside, as urban employment went down and international migration was curtailed [De Vooys, 1933]. The gradual expansion of communication and transport networks during the second half of the nineteenth century [Knippenberg, De Pater, 1988] increased the knowledge of opportunities elsewhere and the possibilities to look for work and housing. Thus, we can expect a gradual increase of migration, probably moderated once cheap commuting opportunities expanded. The increase of income and living standards, which spread to the working classes in the early twentieth century, made residential mobility for other reasons than work more likely. That is, people were more likely to change house to match their status, to accommodate a growing family or to live in a more quiet or healthy area [Pooley, Turnbull, 1998]. 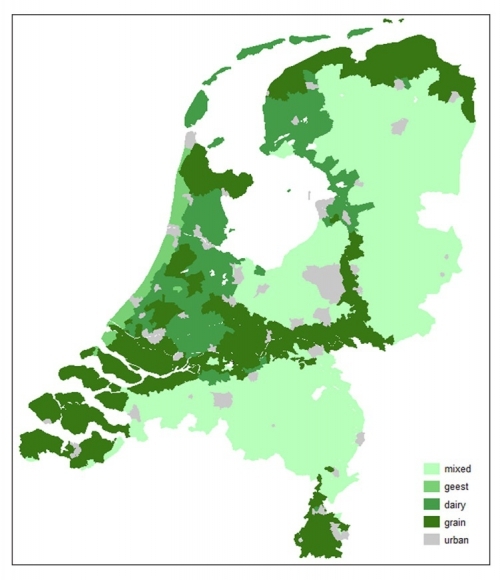 8Although a small country, the Netherlands contained a mix of agricultural systems. We have summarized the information on the local type of agriculture in an 1875 report in a map (see Figure 1) [also Knippenberg, De Pater, 1988]. In the sandy east and south, the old three-field system of mixed agriculture (animal husbandry and grain growing) prevailed. Contrary to the western coastal areas, these regions experienced population growth in the first half of the nineteenth century, which was stimulated by proto-industry. From the 1840s onwards, these areas suffered from the decline of home weaving and spinning caused by competition from foreign industries and the liberalization of trade [Saueressig-Schreuder, 1985; Groote, Tassenaar, 2000]. A massive exodus, however, did not occur. There were still opportunities to reclaim new areas (e.g. by enclosure of the commons), and to intensify output with the help of fertilizers. Overall, the sandy regions remained characterized by a low level of commercialization and mechanization. In the second half of the nineteenth century, they were increasingly linked to the rest of the country through (rail)roads and canals. 9Along the rivers and near the sea, grain cultivation on clay soils was dominant. Particularly in the coastal regions, agriculture was strongly commercialized and integrated in markets. These regions could not compete with the cheap American grain that flooded Europe in the late 1870s and had to undergo a painful period of adjustment. Unemployed agricultural workers went to regional urban centers (such as Groningen), but also to cities in Holland, and abroad, in particular North America [Paping, 2004; Wintle, 1992]. Although regional industries (e.g. strawboard factories) could absorb some of the redundant labor, the clay regions were characterized by net outmigration for a long time [Ekamper et al., 2003]. For some time, dairy farming profited from cheaper animal fodder, but eventually the dairy regions were also affected by lower prices and wages, leading to a ‘rural exodus’. Employment in the coastal regions (e.g. the islands) was also affected by the advent of steamships, limiting the traditional opportunities for combining shipping with dairy farming. Finally, our map displays a small region behind the dunes favorable for growing bulbs. On these geestgronden commercial floriculture expanded, often in the form of labor intensive family farms. We expect outmigration from the latter region to have been relatively limited [De Vooys, 1933: 59]. 10Rural out-migration is also influenced by agrarian inheritance patterns. For instance, a statistical analysis of mid nineteenth century French departments showed that regions with impartible customs were highly correlated with net emigration [Berkner, Mendels, 1978; also Wegge, 1999; Kok, 2010]. Although partibility was the legal norm, farm property was often transmitted integrally to one of the children, with financial compensation to the others. We can assume that the amount and the timing of compensation will have affected outmigration of non-inheriting children. When they received relatively early an advance on their inheritance, they could buy or rent a farm or small business elsewhere. This pattern is most likely in the commercialized and western parts of the country. In some parts of the eastern mixed agriculture regions, strict impartibility was the rule [De Haan, 1994]. The non-inheriting children were hardly compensated, but they had the right to remain on the family farm as long as they were unmarried and worked along the heir. In the mixed agriculture regions in the South, on the other hand, partibility was the rule [De Haan, 1994]. The possibility to hold on to land, however small, is likely to limit mobility [Kok, 2004]. Obviously, the regional practices of farm land division will have affected the mobility of farmer’s children most strongly. However, we assume that partibility still reduced the likelihood of outmigration of families – even non-farming – as (expected) claims to land increased the attraction of staying. 11Generally speaking, migration decisions are the results of comparing the costs of moving and the benefits of staying with the expected gains of living in a another place. In this deliberation different destinations may be compared. According to the classical theory of Stouffer [1940; 846]: ‘the number of persons going a given distance is directly proportional to the number of opportunities at that distance and inversely proportional to the number of intervening opportunities’. In other words, people who had to leave agriculture will have preferred to stay in the region provided there was alternative employment. This has been observed, for instance, in the southern province of Brabant where industrial expansion led to diminished emigration but intensified regional and interregional migration within the province [Saueressig-Schreuder, 1985]. When alternative employment was not available, pressure on the land resulting from population growth will have formed a push factor. Thus, population density has been identified as one of factors explaining rural out-migration [Saueressig-Schreuder, 1985]. 12Similar to other demographic behavior, migration proves to be highly differentiated by socio-economic status. In deciding between staying or leaving, each households had its own weighing of pros and cons, based on income prospects of the head and other family members elsewhere, the costs of moving, and the opportunity costs of leaving. Especially for people with higher rated jobs living in the countryside was often merely part of a personal career trajectory. Church ministers, mayors and heads of school tended to move on and accept better positions in larger communities [Kok, 2004]. Persons working for the government or for large supra local companies (e.g. as railroad officials), also tended to migrate often and over long distances. In general, persons whose income depended on their personal skills more than on immovable properties (like farms or shops) were probably more able and willing to migrate when prospects elsewhere were better. Of course, in the cost-benefit calculation the prospects of family members have to be taken into account as well. Heads may have been ‘tied stayers’ when their own chances of improvement were outweighed by the incomes brought in by their partner and/or children. This might be an important factor in the mobility of farm workers. Although their wives tended to work only during the harvest season (harvesting potatoes, picking berries), their children were normally employed elsewhere as living-in workers and contributed a large proportion of their earnings to their parents [Kok, 2004]. Thus, although long-distance migration might have proved advantageous to the father, it could well have had a negative impact on the income of the family as a whole. 13Apart from economic factors, social capital is highly important. The networks on which social groups depend for information on jobs and housing differ strongly. Farmers and workers in agriculture were strongly dependent on local contacts and their own, highly localized, reputation. The geographic aspects of social capital are sometimes described as ‘spatial capital’. The community- or family-specific knowledge on other places are shown to have an independent effect on the likelihood of individuals to migrate, apart from their own personal migration experience [e.g. Bras, Neven, 2007; Kesztenbaum, 2008]. 14Although a small country, until the early twentieth century the Dutch countryside was characterized by strong regional variation, caused by differences in the level of commercialization, type of agriculture, and relative isolation and persistence of local dialects and customs. The variation was enlarged by religious diversity. The southern part of the country was predominantly Roman Catholic, in the center Orthodox Protestant groups were numerically important (forming the so-called ‘Bible Belt’), whereas Liberal Protestants were the most numerous group in the northern and western parts, sometimes (e.g. in the Northwest) in combination with large minorities of Roman Catholics. In the last quarter of the nineteenth century, the competition between religious groups intensified, strengthening their (cultural and social) isolation from one another. On the southwestern islands of the province of Zeeland, emigration and long distance migration of either Roman Catholics or Protestants has been associated with being a local minority [Wintle, 1992, also Bras, 2003]. Little is known on religious differentials in migration propensities. A study focusing on emigration to America has shown that Roman Catholics were underrepresented compared to Protestants [Swierenga, Saueressig-Schreuder, 1983], but this may have been related to their socio-economic profile. Protestants were more likely to be farmers seeking land. We lack studies on the autonomous impact of religion on mobility. Because, in this period, Roman Catholics and Orthodox Protestants were actively shielded by their church leaders from outside, ‘modern’ influences [Kok, Van Bavel, 2006], we expect them to be less open and responsive to information on opportunities elsewhere and thus to have a lower likelihood of interregional and urban migration. 15As said, we will focus on the (first observed) moves of household heads in the age of 25 to 40 years old. Most of these heads were married men, and we will contrast their moves to those of widowed men and women. We expect widowed heads to more dependent on their local support networks and poor relief, which probably limited their likelihood to migrate. In the next section, we describe how we have operationalized the general hypotheses to study the relative importance of different types and flows of migration. 16The database for our analysis comes from the Historical Sample of the Netherlands (HSN), more specific the Data Set Life Courses Release 2010.01). The HSN contains standardized information on the life histories of a representative portion of the Dutch nineteenth and twentieth century population [Mandemakers, 2000]. The random sample of HSN has been drawn from on birth certificates from 1812-1922 (n=77000), which were linked to other civil records (marriage and death certificates) and population registers to compile life histories of research persons (RP) as completely as possible. Population registers have been introduced in the Netherlands in 1850. Basically, they kept the census ‘up-to-date’ by recording changes in households. Thus, information was provided on occupations, religion, births, deaths and marriages, and place and date of provenance and destination of household members. For our purpose, we use the part of the HSN which has been completed with information from the population registers, pertaining to RP’s born between 1850 and 1922. 17Concerning people’s migration behavior, we have to take into account that a person living in a rural area might either migrate locally, to a city, to another region, or even to another country – if he or she decides to migrate at all. In this paper we are studying the first occurrence of a – competing – migration event using event history analysis. Thus, we are studying the time that it takes till a migration event occurs and we link differences in the elapsed time to differences in explanatory variables [Cleves et al. 2010]. Given the fact that we are interested in contrasting different migration possibilities, a methodological problem with applying standard event history analysis arises. A ‘standard’ event history analysis focuses on only one of the described behaviors and its occurrence. It assumes that persons who experience a competing migration event stay at risk and can still experience an event of interest later on [Gooley et al. 1999: 702]. The underlying hazard rate (the complement of a Kaplan-Meier estimate or 1 – KM) is hence assumed to be independent from such competing migration possibilities. However, often, as it is in our case of studying first observed migrations, such an event of interest is not possible anymore. Taking the example of death from cancer, we can recognize that such an event of death cannot occur, once a person died from another reason. Additionally, this example demonstrates that the hazard of dying from cancer in fact depends on the occurrence of other competing events, violating earlier assumptions. Therefore, in a setting like ours, the hazard function (1-KM) of the standard event history analysis cannot be interpreted as the overall probability of experiencing a certain migration event. The censoring of observations that are failures from a competing migration event causes 1-KM to be non-interpretable and leads to a biased estimate of probability of failure [Gooley et al. 1999: 698]. Instead, to reflect the different competing migration outcomes, accounting for their mutual dependencies, we run a competing risk event history analysis. Thus, we analyze in how far the incidence of the different migration events depend on certain contextual or individual characteristics, via testing the effects of our covariates on the cumulative incidence function (CIF), applying the model developed by Fine and Gray . The cumulative incidence function (CIF) is a function of all sub-hazard rates and hence takes failures of competing risks into account. In our final models, the estimated sub-hazard ratios are reported. These can be interpreted in a similar way as ‘normal’ Cox-regression hazard ratios. 18The model developed by Fine and Gray  is a semi-parametric event history model, assuming the sub-distribution hazards (SH) being proportional. We tested the event specific hazards (ESH) for being proportional or not, via visual inspection of separate log-log plots for each of our included explanatory variable for each migration events separately [Cleves et al., 2010: 209-210].1 The graphical inspection reveals some limited deviations from the proportional hazard assumption of some of our variables in some cases; while the proportional hazard assumption in general seems to hold. Only for the last two competing migration events (for urban migrations outside the region and emigration) the proportional hazard assumption fails. As the standard modeling approach, assuming proportional event-specific hazards (ESH), misspecifies the proportional sub-distribution model (SH), our different models still offer a summary analysis of the estimates representing time-averaged hazard ratios, also called the least false parameter; even in the case that non-proportional sub-distribution hazards (SH) are present [Beyersmann et al. 2009: 965; Grambauer et al. 2008: 875]. 19Within a multi-level framework – that is, research cases being nested in groups of a higher order – cases of the same group tend to be more similar to each other. In our case, we have several individuals out of the same families (once they became heads), which are again nested in municipalities and economic-geographic regions. Due to the clustering of these groups, error terms in a regression estimation cannot be assumed to be distributed independently anymore [Cameron, Gelbach, Miller, 2008; 2011; Pepper, 2002]. Hence, standard errors turn out to be downwardly biased. To solve this problem, we account for the clustering in the data during the estimation process and, as we have nested clusters, estimate clustered robust error variance for the highest level of clustering [see Camoron, Gelbach, Miller, 2011; Pepper, 2002]. By doing so, we treat these clusters as units of observations. Due to the fact that we have a relative large number of clusters, we get consistent estimates [Wooldridge, 2003: 134; Miller, Cameron, Gelbach, 2011]. 20In the previous section, we have described variables which frequently appear in studies of rural migration. Usually these studies are only looking at particular areas or particular types of migration. In our analysis, we bring these factors together in order to assess their importance for understanding rural migration for the whole of the country. We will discuss their operationalization in order of appearance in our model (see below). 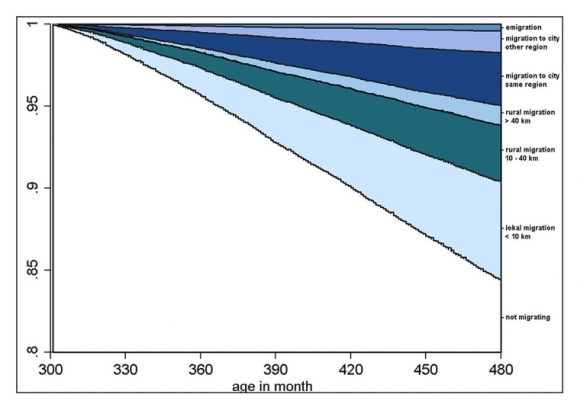 In this model, we analyze first migrations of (heads of) households between age 25 and 40. We take into account all households that existed in rural localities. This means that we include the households of HSN research persons as well as their parental households. In distinguishing between urban and rural communities we follow Kooij [1985: 111-113]. He defines urban communities as places with over 10000 inhabitants and with less than two and a half percent of the population employed in the agricultural sector. 21The first variable in our model, see Figure 4, is the one that operationalizes the effects of broad contextual change. These period effects are integrated in the model by specifying the decade in which observation of the heads begins, starting with 1850-1859. Next, we look at differences in the hazards of (different types of) migration across agricultural systems. We have summarized the 12 types specified in an agricultural survey of 1874 [Verslag van den Landbouw, 1875] by creating four categories: floriculture, dairy farming, grain cultivation, and mixed agriculture. Then, we look at partibility of farm land. On the basis of contemporary surveys on local inheritance practices [Van Blom, 1915; Baert, 1949] among rural notaries, we have classified each municipality according to whether the farm was (generally) held intact or not. The population density of each municipality was calculated by dividing the number of inhabitants by the surface. This information is provided in the censuses and made available in the Historical Database of Dutch Municipalities [Beekink et al., 2003]. Our regional classification is based on the 44 economic-geographical regions formed by the Central Bureau of Statistics in 1922 [De Bie, 2009]. To study the effects of regional non-agricultural employment in providing incentives to stay in the region, we have calculated (male and female) employment outside agriculture, per region (because the censuses provide this information only for communities with more than 5000 inhabitants we could not calculate on the local level). The likelihood to emigrate is, of course, affected by proximity to the national border. An emigration may in fact be only a cross-border regional migration. Thus, we control for proximity by specifying whether a region is bordering on Germany or Belgium. 22Ideally, we would like to include the household composition, in particular the number and gender of adolescent children, who are likely to contribute to the family income. However, we have refrained from inserting time-dependent variables in our already highly complex model. Instead, we only make a distinction between nuclear and extended households, supposing that in extended households joint labor or pooled income forms a disincentive to migration. To a lesser extent, we expect this to be the case in households only extended with non-kin (servants or boarders). To classify household according to social economic status, we have coded the occupational titles of household heads according to the international HISCO scheme [Van Leeuwen, Maas, Miles, 2002]. We then stratified the HISCO codes according to manual/nonmanual work, skill level, supervision, and economic sector, as proposed in the HISCLASS scheme [Van Leeuwen, Maas, 2011]. Subsequently we reordered them into six large social-economic groups: Elite, Lower middle class, Farmers, Skilled workers, Unskilled workers and Unknown or without. 24Finally, we include a number of individual variables. Firstly, we test if widows and widowers have lower chances to migrate than married men. Secondly, we look at the personal migration experience of the head. For this, we can only use a rough indicator, namely the difference between the current place of residence and the birth place. Thirdly, we include religion of the household heads, using the following categories: Catholics, Liberal Protestant, Orthodox Protestants and a rest category of others (non-Denominationals, Jews, and unknown). The principles underlying this classification have been described elsewhere [Kok, Van Bavel, 2006]. Finally, we add a variable stating whether the head of the household forms a religious minority. For this, we have used the number of Roman Catholics per municipality, as stated in the censuses [also in Beekink et al., 2003]. Thus, Roman Catholics living in municipalities with less than 20% Roman Catholics are considered a minority, and (orthodox or liberal) protestants living in communities with more than 80% Roman Catholics are also considered a minority. 25In this section, we provide a brief description of the different types of migrations experienced by household heads (almost always moving as a family). In Figure 2, we present the average distances of migrations by economic-geographic region for two periods. We can see clearly that in the second period, 1890-1941, average migration distances were longer than in the first, 1850-1890. There are some interesting regional shifts as well. In the 1850-1890 map we see high average distances in northern regions that were relatively peripheral to the western centers of commerce and industry, yet traditionally integrated in trading networks and commercial economy. In the second periods these regions still stand out, but they have been joined by the Northeast and by regions in the South, ranging from the grain-growing areas in Zeeland, the mixed agriculture on sandy soils in Brabant, to the mining regions of Limburg. 26Figure 3 shows the (cumulative) hazards of experiencing a specific kind of migration, namely the first migration of household heads observed between the ages of 25-40. We should realize that after the first migration, many heads keep on migrating. Thus, we are not showing (age-specific) migration hazards, but merely the distribution of first moves. The figure shows that the likelihood of rural heads of households to migration (between age 25 and 40) was rather limited. In fact, only 15% of the heads experienced an migration event till the age of 40 (480 months). This on first glance rather low level of migration does not reflect an overall low probability of household heads to migrate. Our data indicates that up to 34% of the observed heads living in rural areas migrated at any time point in their life. Thus, our descriptive results only show the probability for heads to migrate within the given age period. In fact, although most heads in our data-set ‘survive’ till the age of 40 without migrating, they might well experience a migration event afterwards (and a lot of them have done so). 27To study the heads’ migration behavior in more detail, we have made distinctions by a combination of type of destination (urban or rural) and distance. The most important moves are either local (within the municipality or to another village less than ten kilometers away) or to a city. As we can see, emigration is very rare. Also, moves to a rural destination over more than forty kilometers is relatively rare as well. 28Our competing-risk analysis consists of six models. In each model, an event of interest (e.g. emigration) is analyzed with the other forms of migration treated as competing events. By showing the models together, we get a good overview of which factors stimulated migration as such, and which factors only stimulated a specific type of migration. In this way, we are able to get a better grasp of the contrast – or perhaps similarity – between local and regional mobility within the countryside and out-migration (‘flight from the land’). Our migration typology ranging from local migration to emigration can be seen as a scale of increasing distancing from the local, rural community. 29Based on the literature on Dutch rural migration we expect that the agricultural crisis of the 1880s and the permanent diminishing of opportunities would induce people from afflicted regions to move to other areas, to cities, or abroad. Figure 4 shows that, overall, families had the lowest migration intensity in the 1860s (contrasted to the 1850s). After the 1860s we witness a strong increase in out-migration, in particular to cities. This movement intensifies in the early twentieth century. Emigration seems to have reached a high point in 1900-1909, interregional migration (migration to rural destination over more than forty kilometers) in the 1910s, and migration to cities in the 1920s. But local migration intensified as well, especially after 1920. This might reflect the growing importance of not-work related motives for moving, such as finding a better house to adjust for family size [Pooley, Turnbull, 1998]. 30The prevailing agricultural system may be associated with different intensity and different types of migration. We have described how the three-field system on sandy soils was indicative of a low level of commercialization, a dependence on family labor, and in some regions on a combination of farming with household textile production. Apart from family, strong connections to neighbors was important in these regions, possibly because of a traditional dependence on common fields (which were almost all enclosed during the nineteenth century). We expect people in these areas to have relatively strong ties to the local community, relatively low integration in networks of information and relatively limited access to transport. Thus, we anticipate overall low risks of migration in the ‘mixed agriculture’ regions. The strongest outmigration can be expected from the grain growing regions, which were affected most strongly by the competition from abroad. Families in the dairy farming and in particular the floriculture regions were probably less inclined to leave, as export opportunities remained rather favorable. The figure supports these hypotheses to some extent. Overall migration hazards in mixed agriculture areas (the reference category) are indeed rather low, with a notable exception in the case of regional migration: when people from mixed regions moved, they preferred their own area. They were less inclined to move locally, which can (in part) be explained by the strong attachment to family farms in the Eastern areas of the Netherlands. Nearby cities, however, are not a popular destination in the mixed agriculture areas. Especially from the floriculture area people went to nearby cities, but their likelihood to go to more distant cities was relatively low. We expected impartibility of land to decrease the likelihood of staying, as fewer people had parcels of land which could add to the family income. However, our outcomes suggest the opposite: impartibility increased regional migration and decreased (but not statistically significant) the likelihood of outmigration. Probably, partibility had increased population pressure on available resources, stimulating land flight. We have also added population density to our regression, and the outcomes point in the same direction: more pressure leads to significantly less regional migration, and to more long-distance urban migration. As expected (regionally aggregated) employment outside agriculture affected moving to a nearby city. This is in line with the notion of intervening opportunities: the more opportunities were offered within the region (generally in cities), the stronger the likelihood to stay in the region. To take account for the fact that emigration can in fact be a short-distance move from a village in the Netherlands to one in Germany or Belgium we have added a dummy variable for border regions. As expected, emigration in these areas was much more likely. Also, we find lower hazards of moving to a nearby city, which is not surprising as these are rather peripheral regions. 31We expected extended household to have more local ties favouring the family economy, and thus to have lower migration hazards. Figure 4 confirms this. Especially households extended with kin were unlikely to leave the place of residence. Social class is the most important predictor of migration. All groups had much higher hazards to migrate than farmers, in particular to move to cities. Heads of household with elite occupations had the highest hazards to make a long distance rural migration, or to go a city. Their hazards to go to a city in another region are almost 25 times higher than those of farmers. Relative to the other groups, unskilled workers were more likely to make local or regional moves, and to be less involved in long distance migrations or moves to a city, albeit always much more than farmers. The birth places of persons living in the household (including servants, boarders and lodgers) can be seen as indicators of the spatial capital of households, or the information on different places. We can see that variety of places in the family’s ‘portfolio’ was related to a higher likelihood of local or regional moves, whereas the presence of urban places in the portfolio increased the likelihood to move to city or the emigrate, and actually decreased the chance to migrate locally. 32Individual characteristics of the head of the household also play an important role. Widowers and widows were much less prone to move than married men – probably because they depended mores strongly on the local (support) network. As expected, previous migration, even if only measured by the difference between birth place and place of current residence, is a strong predictor of migration, and interestingly also affects local migration. Religious affiliation also played a role in directing migration flows. Overall, Roman Catholics were less inclined to migrate. Liberal and Orthodox Protestants, as well as the rest group were more likely than Roman Catholics to make regional or interregional moves. In this respect, the expected reticence of Orthodox Protestants was not found – in terms of migration they do not differ from Liberal Protestants. Roman Catholics who dwelt in a predominantly Protestant place made little moves within that place, and were more likely to move to another village or to a nearby city. Protestants forming a minority, however, tended to make more long-distance moves to either rural or urban destinations. This may reflect the traditional social and regional dividing lines in the country. Until well into the nineteenth century, elite positions in the Roman Catholic provinces of Brabant and Limburg tended to be held by Protestant Northerners. Level of significance: * 0.1;** 0.05; *** 0.01;**** 0,001. Distances are measured by calculating the distance between the centroids of each municipality. 33This study intended to offer an overall view on migration push factors affecting the rural population of the Netherlands, focusing on heads of households. In studying push factors, we specify between different types of destination. We aimed to discover, in one all-encompassing model, the relative importance of various levels (individual, household, community and region) on the intensity and diversity of rural migration. What we have been able to show are three things. First of all, by analyzing the full range of migration options (from local moves to emigration), we can discern between factors stimulating migration as such, and factors only affecting particular types of migration. Thus, overall migration increased after 1860, but especially rural to urban migration. Households extended with kin, and households headed by widows or widowers had lower overall migration hazards. And regional and interregional rural migration (more than other types) was more likely among Protestants than among Roman Catholics. Moving to a relatively distant city was a particularly likely option for heads with elite occupations. Secondly, our approach made it possible to assess simultaneously the importance of factors on the individual, the household, the local and the regional levels. Socio-economic position, civil status and migration experience of the head proved to be major factors, as could be expected, but we have also found highly interesting effects of religion and religious minority position, as well as of the ‘portfolio of places’ of a family. Strong differences were found by agricultural type, with people living in ‘mixed’ agriculture regions having low migration hazards, even with all other factor held constant. Weaker, but for some forms of migration still significant, effects were found for impartibility of land, population density and non-agricultural employment. Thirdly, and most important, our research has raised questions that call for a renewed look at the role of family and religion setting in explaining rural migration streams. A family’s ‘knowledge’ of places – as indicated by the birth places of family members – clearly affects migration risks and directions. But what exactly do our findings point at? Does the portfolio merely reflects the migration trajectory of the family itself, and thus its own mobility? Or do household members (such as more distant relatives, servants and lodgers) bring knowledge about opportunities and contacts in other places to the family? We have also brought to light interesting religious differentials in migration as well as specific migration flows of religious minorities. It will be interesting to discover whether increased competition between churches stimulated out-migration or whether these religious differentials stand for other (unobserved) characteristics. 34To be sure, our analysis cannot replace the local studies from which we have drawn our main hypotheses. Every region, every social group, and every period has a specific mix of factors influencing intensity and direction of migration. Identifying this mix would mean running separate models for different social groups, regions or periods as well as including interaction effects, but that would have made our story too long and our model too complex. In future research, we aim to incorporate in the model more, dynamic, elements of family composition. For instance, does the presence of adolescent sons and daughters lower migration risks of families? Ideally, we would like to include information on land ownership or tenancy, home ownership, income and education, which hopefully will be added to the Historical Sample of the Netherlands in the future. Finally, at the local level, we would like to add information on e.g. unemployment and transport infrastructure. 35Rural migration is a multifaceted demographic phenomenon. Among others aspects, one can study specific trajectories, the networks connecting place of destination to place of provenance, and the cost and benefit calculations of individuals and households. Here, we have chosen to focus on just one aspect: the likelihood of rural heads of households to make a specific move given various background factors. Our outcomes indicate that the statistical analysis of a large population sample is fruitful, but in the end, only a combination of different, qualitative and quantitative, approaches will reconstruct who decided, and why, to leave the land. BAERT J. (1949), Deling van grond bij boerennalatenschap, De Pacht. Maandblad van de Nederlandsche pachtraad, vol. 9, pp. 134-152. BEEKINK E., BOONSTRA O., ENGELEN T., KNIPPENBERG H. (2003), Nederland in verandering. Maatschappelijke ontwikkelingen in kaart gebracht, Amsterdam, Aksant, 186 p.
patterns in Western Europe, 1700–1900 », in C. Tilly, L.K. Berkner (eds. ), Historical studies of changing fertility, Princeton, Princeton University Press, pp. 209-223. BEYERSMANN J., LATOUCHE A, BUCHHOLZ A., SCHUMACHER M. (2009), Simulating competing risk data in survival analysis, Statistics in Medicine, vol. 28, no. 6, pp. 956-971. BIE R. de (2009), De economisch-geografische indelingen van het CBS, 1917-1960, Den Haag/Heerlen, Centraal Bureau voor de Statistiek, 39 p.
BLOM D. van (1915), Boerenerfrecht (met name in Gelderland en Utrecht), De Economist, vol. 64, pp. 847-896. BRAS H. (2003), Maids to the city: migration patterns of female domestic servants from the province of Zeeland, the Netherlands (1850-1950), The History of the Family. An International Quarterly, vol. 8, no. 2, pp. 217-246. BRAS H., NEVEN M. (2007), The effects of siblings on the migration of women in two rural areas of Belgium and the Netherlands, 1829-1940, Population Studies, vol. 61, no. 1, pp. 1-19. CAMERON A.C., GELBACH J.B., MILLER D.L. (2008), Bootstrap-based improvements for inference with clustered errors, The Review of Economics and Statistics, vol. 90, no. 3, pp. 414–427. CAMERON A.C., GELBACH J.B., MILLER D.L. (2011), Robust inference with multiway clustering, Journal of Business & Economic Statistics, vol. 29, no. 2, pp. 238-249. CLEVES M., GOULD W.W., GUTIERREZ R.G., MARCHENKO Y. (2010), An introduction to survival analysis using Stata, College Station Tx., Stata Press, 412 p.
DRIBE M., LUNDH C. (2005), People on the move. Determinants of servant migration in nineteenth century Sweden, Continuity and Change, vol. 20, pp. 53-91. EKAMPER, P., ERF R. van der, GAAG N. van der, HENKENS K., IMHOFF E., POPPEL F. van (2003), Bevolkingsatlas van Nederland. Demografische ontwikkelingen van 1850 tot heden, Den Haag, NIDI, 176 p.
ENGELEN T. (2009), Van 2 naar 16 miljoen mensen. Demografie van Nederland, 1800-nu, Meppel, Boom, 216 p.
FINE P., GRAY R.J. (1999), A proportional hazards model for the subdistribution of a competing risk, Journal of the American Statistical Association, vol. 94, no. 446, pp. 496-509. FONTAINE L. (2007), « Kinship and Mobility. Migrant Networks in Europe », in D.W. Sabean, S. Teuscher, J. Mathieu (eds. ), Kinship in Europe. Approaches to long-term development (1300-1900), London and Oxford, Berghahn Books, pp. 193-210. GRAMBAUER N., SCHUMACHER M., DETTENKOFER M., BEYERSMANN J. (2010), Incidence densities in a competing event analysis, American Journal of Epidemiology, vol. 172, no. 9, pp. 1077-1084. GOOLEY T.A., LEISDENRING W., CROWLEY J., STORER B.E. (1999), Estimation of failure probabilities in the presence of competing risks: New representations of old estimators, Statistics in Medicine, vol. 18, pp. 695–706. GROOTE P., TASSENAAR V. (2000), Hunger and migration in a rural-traditional area in the nineteenth century, Journal of Population Economics, vol. 13, pp. 465-483. GUILMOTO C.Z., SANDRON F. (2001), The internal dynamics of migration networks in developing countries, Population: An English Selection, vol. 13, no. 2, pp. 135-164. HAAN H. de (1994), In the shadow of the tree. Kinship, property and inheritance among farm families, Amsterdam, Spinhuis, 323 p.
HEIDE H. ter (1965), Binnenlandse migratie in Nederland, The Hague, Staatsuitgeverij, 515 p.
HISTORICAL SAMPLE OF THE NETHERLANDS, Data Set Life Courses Release 2010.01. KESZTENBAUM L. (2008), « Places of life events as bequestable wealth. Family territory and migration in France, 19th and 20th century », in T. Bengtsson, G. Mineau (eds.) Kinship and demographic behavior in the past, Dordrecht, Springer, pp. 155-184. KNIPPENBERG H., PATER B. de (1988), De eenwording van Nederland. Schaalvergroting en integratie sinds 1800, Nijmegen, SUN, 224 p.
KOK J. (2003), « Nederland in beweging. Aspecten van migratie, 1876-1960 », in E. Beekink, O. Boonstra, T. Engelen, H. Knippenberg (eds. ), Nederland in verandering. Maatschappelijke ontwikkelingen in kaart gebracht, Amsterdam, Aksant, pp. 25-44. KOK J. (1997), Youth labor migration and its family setting, The Netherlands 1850-1940, History of the Family. An International Quarterly, vol. 2, no. 4, pp. 507-526. KOK J. (2004), Choices and constraints in the migration of families. Central Netherlands 1850–1940, History of the Family. An International Quarterly, vol. 9, no. 2, pp. 137–158. KOK J. (2010), « The family factor in migration decisions », in J. Lucassen, L. Lucassen, P. Manning (eds. ), Migration History in World History. Multidisciplinary Approaches, Leiden, Brill, pp. 215-250. KOK J., BAVEL J. van (2006), « Stemming the tide. Denomination and religiousness in the Dutch fertility transition, 1845-1945 », in R. Derosas, F. Van Poppel (eds. ), Religion and the Decline of Fertility in the Western World, Springer, Dordrecht, pp. 83-105. KOOIJ P. (1985), « Stad en platteland », in F.L. van Holthoon (ed. ), De Nederlandse samenleving sinds 1815. Wording en samenhang, Assen, Van Gorcum, pp. 93-115. LEEUWEN M. van, MAAS I., MILES A. (2002), HISCO. Historical International Standard Classification of Occupations, Leuven: Leuven University Press, 441 p.
LEEUWEN M. van, MAAS I. (2011), HISCLASS. A Historical International Social Class Scheme, Leuven, Leuven University Press, 184 p.
LESGER C., LUCASSEN L., SCHROVER M. (2002), Is there life outside the migrant network? German immigrants in XIXth century Netherlands and the need for a more balanced migration typology, Annales de Démographie Historique, no. 2, pp. 29-50. LUCASSEN J. (1987), Migrant labour in Europe 1600-1900. The drift to the North Sea, London, Sydney and Wolfeboro, New Hampshire, Croom Helm, 339p. MANDEMAKERS K. (2000), « Netherlands – The Historical Sample of the Netherlands », in P. Hall, R. McCaa, G. Thorvaldsen (eds. ), Handbook of International Historical Microdata, Minnesota, Minnesota Population Center, pp. 149-178. MASSEY D.S. (1990), Social structure, household strategies, and the cumulative causation of migration, Population Index, vol. 56, no. 1, pp. 3-26. MINISTERIE VAN BINNENLANDSCHE ZAKEN (1875), Verslag van den landbouw in Nederland. Grootte der gronden tijdens de invoering van het kadaster, ‘s-Gravenhage, Van Weelden en Mingelen, 266 p.
OOMENS C.A. (1989), Emigratie in de negentiende eeuw, Supplement: CBS, De loop van de bevolking in de negentiende eeuw. Statistische onderzoekingen nr. M35, CBS, Voorburg/Heerlen, 48 p.
ORIS, M. (2003), The history of migration as a chapter in the history of the European rural family: An overview, The History of the Family. An International Quarterly, vol. 8, no 2, pp. 187-215. PAPING R. (2004), Family strategies concerning migration and occupations of children in a market-oriented agricultural economy, The History of the Family. An International Quarterly, vol. 9, no. 2, pp. 159-191.
PEPPER J.V. (2002), Robust inferences from random clustered samples: an application using data from the panel study of income dynamics, Economics Letters, vol. 75, pp. 341–345. POOLEY C., TURNBULL, J. (1998), Migration and mobility in Britain since the 18th century, London, UCL Press, 440 p.
ROSENTAL P.-A. (1999), Les sentiers invisibles : espace, familles et migrations dans la France du 19e siècle, Paris, Éditions de l'École des Hautes Études en Sciences Sociales, 256 p.
SAUERESSIG-SCHREUDER Y. (1985), Dutch Catholic emigration in the mid-nineteenth century: Noord-Brabant, 1847-1871, Journal of Historical Geography, vol. 11, no. 1, pp. 48-69. STOUFFER S.A., (1940), Intervening opportunities: a theory relating to mobility and distance, American Sociological Review, vol. 5, no. 6, pp. 845–867. SWIERENGA R.P., SAUERESSIG-SCHREUDER Y. (1983), Catholic and protestant emigration from the Netherlands in the 19th century: a comparative social structural analysis, Tijdschrift voor Economische en Sociale Geografie, vol. 74, no. 1, pp. 25-40. VOOYS A.C. de (1933), De trek van de plattelandsbevolking in Nederland. Bijdrage tot de kennis van de sociale mobiliteit en de horizontale migratie van de plattelandsbevolking, Groningen, Wolters, 197 p.
WEGGE S.A. (1998), Chain migration and information networks: evidence from nineteenth-century Hesse-Cassel, Journal of Economic History, vol. 58, no. 4, pp. 957-986. WEGGE S. (1999), To part or not to part: emigration and inheritance institutions in nineteenth-century Hesse-Kassel, Explorations in Economic History, vol. 36, no.1, pp. 30–55. WINTLE M. (1992), Push factors in emigration: the case of the province of Zeeland in the nineteenth century, Population Studies, vol. 46, pp. 523-537. WOOLDRIDGE J.M. (2003), Cluster-sample methods in applied econometrics, The American Economic Review, vol. 93, no. 2, pp. 133-138. 1 In case of continuous explanatory variables, we first categorized our variables and then continued with visual inspection of the log-log plots. Espace Populations Sociétés est mis à disposition selon les termes de la licence Creative Commons Attribution - Pas d'Utilisation Commerciale - Pas de Modification 4.0 International. Métro-boulot-dodo: What’s New in our Routines of Mobility? Indigenous Peoples. A geographical Approach of Autochtonies?